In the early 1970's, two brothers from one of America's wealthiest families tried to corner the silver market. 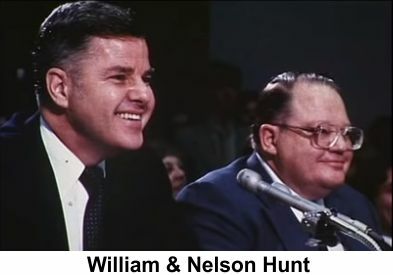 The brothers were Nelson Bunker Hunt and William Herbert Hunt, and they began to accumulating large amounts of silver to use as a hedge against inflation. Before December of 1974, it was against the law for a U.S. citizens to buy or sell Gold bullion. The 1970's were marred with inflation, causing the value of the dollar to fall; so the brothers bought large quantities of silver to preserve the value of their family fortune. In 1974, on the floor of the COMEX, Nelson Bunker Hunt declared "almost anything is better than paper money." By 1979, with the help of some middle eastern investors, the brothers were estimated to hold more than a third of the entire world's supply of silver, nearly 100 million troy ounces of silver. This caused the price of silver to jump from $6.00/oz. in early 1979 to an all time high of $48.70/oz. in January of 1980. On January 7, 1980, the New Your Metals Market (COMEX), in response to the Hunt's cornering of the silver market, put an end to their manipulating game. The exchange rules regarding leverage were changed, when the COMEX adopted "Silver Rule 7" placing restrictions on the purchase of commodities, on margin. Unfortunately for the brothers, they had highly leveraged their purchases of silver in margin accounts. 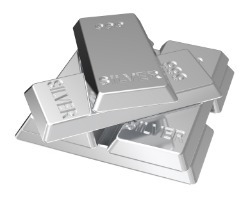 This made them unable to meet their obligations in the silver market, causing the silver price to drop 50% in four days. On March 27, 1980, the price of silver fell from $21.62/oz. to $10.80/oz. this day is also known as "Silver Thursday." Shortly thereafter, the Hunts were brought in front of Congress and charged with market manipulation. They were fined $10 million each and banned from trading in American Commodity Markets. The video below was produced two weeks after it was revealed that the Hunt Brothers attempted to corner the Silver Market.